Why Buy Organic Free Range Chicken Over Grocery Store Chicken? Not a lot of people understand what the difference is between conventionally farmed and organic chicken, other than a rough idea that it’s supposed to be better for you. But we’re here to give the full details on just how and why organic chicken is better for you and your family, and why we feel so confident that you’ll never want to go back to store bought chicken after trying our fantastic organic products. Organic farming emerged, or rather re-emerged, as a reaction to the industrial practices of the early to mid-20th century, particularly those that appeared during and after World War II. The now illegal pesticide DDT was invented in 1939 and used on soldiers to kill lice, and vice-versa, chemicals first designed to make explosives and nerve gas were used as fertilizers and insecticides. New methods were invented to control every factor that might influence efficiency, consistency, or profit. Extensive irrigation systems, driven by new drilling and pumping technology and a healthy fear engendered by the Dust Bowl, began draining underground water fast enough to water entire fields. New research into high-yielding breeds of food plants, and animals drastically increased the efficiency of massive, specialized industrial farms. As farmers of the 1950’s and 60’s began to focus more and more on a single crop or animal, they started looking into confinement facilities that would make it easier to manage larger and larger animal populations with more control over external dangers such as predators and bad weather. 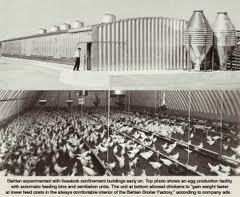 To this effect, a man named Walt Behlen invented a building known as the Broiler Factory in 1962, which would eventually become the foundation of conventional farming today. The problem with conventional, factory farming is that in order to maintain the health of your livestock outside of their natural ecosystem, you have to replace that system, on a limited budget and with our limited understanding of how the original actually works. Zoos have a hard enough time trying to replicate it exactly; trying to modify it with a goal other than a complete, self-balancing system is like trying to build an engine from the wrong instruction manual with your feet. Most every attempt to improve the status quo results in further complications. The history of factory farming is a history of people either chasing their tails to find solutions to the problems their solutions keep causing, or ignoring those problems when it’s more profitable to do so. For example, the massive over population and crowding meant to get the most meat from the least land results in rampant disease, and the antibiotics used to treat them not only fail to bring the rates of bacteria down to the same levels as before, they create more powerful diseases, immune to our best medical defenses. Bringing chickens into a big metal container may help to protect them from predators and the weather, but it denies them access to sunlight, necessary for creating Vitamin D, and natural forage of grass and insects which contribute nutrients like Vitamin E and Omega 3 fatty acids, and the available supplements aren’t capable of bringing those levels back to normal. To help deal with these deficiencies, or maybe just to do something with the massive excess of leftovers that can’t be sold to people or even pets, chickens are often fed byproducts like meat, blood, skin, feathers and feces from other chickens, which even further increases the risk of contamination and disease. Then, to deal with this ridiculous level of bacteria, the chicken meat is treated with chlorine to disinfect it, a practice which the European Union finds such an unacceptable risk to human health that it has banned the import of American chicken. The resulting product is just a shadow of what chicken can be; it has less nutritional value, more health risks, and it just doesn’t taste as good. So the companies have to resort to tricking us. Feeding chickens small doses of arsenic changes the color of their meat; giving it a slightly pinker and healthier tone, to try and trick us into thinking it will be better than it really is. The USDA has deemed small doses to be safe for human consumption, even though new studies have found arsenic to be even more dangerous than previously thought and adding arsenic to poultry feed is now a regular practice. So is injecting chicken with salt-water in order to cover up the lack of taste in the meat itself. Public awareness of the serious dangers that pesticides and other frequently used toxic chemicals can pose to the individual and the environment first developed after 1962 when Rachel Carson first published Silent Spring on the negative effects of DDT. By the early 70’s there were a number of small organizations and state regulations helping to define and promote organic farming as a practical, sustainable, and responsible alternative to conventional farming, though the USDA only started officially looking into it in 1980. During the financial crisis of the 80’s, several larger-scale farms found themselves unable to afford pesticides and learned on accident that the public was willing to pay more for a safer, healthier product. By 1989, organic foods were in high demand, and fraud was rampant; so in 1992, the USDA started work creating a system of standards and regulations that would take ten years to complete. 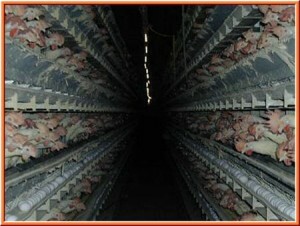 Today, while factory farms continue to search for any means to improve short-term efficiency and income, at the cost of the consumer if necessary, organic farmers pay money to subject themselves to rigorous inspection and the highest standards, searching for a perfect balance of financial, ecological, and social sustainability. Have you ever heard the saying ‘you are what you eat’? Well the animals we eat are what they eat too. Organic chickens are fed organic grains, and eat plants and insects from organic pastures. Conventional chickens eat conventional grains filled with synthetic fertilizers and pesticides. Fun fact; regulations are weaker on a company reselling toxic waste as a synthetic fertilizer than they are on dumping them in a lined landfills. Because clearly we shouldn’t be putting things like “lead, arsenic, cadmium, chromium, nickel and dioxin, among other toxic substances” into contained land-fills far, far away so that it can eventually find its way into our food and water supplies. We should put them directly onto our well irrigated crop fields. Procrastination is for chumps. You may think that it would be safer to eat the conventional chicken that eats these contaminated crops than to eat them yourself; to distance yourself by one more degree, but that isn’t necessarily the case. Some of these toxins, including lead and mercury, can undergo processes called bioconcentration and biomagnifications. Bioconcentration means that instead of breaking down or passing through the organism, the toxins build up inside it until there’s more of the toxin in the organism than in the environment, and biomagnifications means the higher in the food chain you eat, the higher the concentration of the toxin. The use of antibiotics on farm animals, including poultry, is a serious health risk that threatens us all. Science and history have proven time and time again that we don’t need to abuse these drugs the way we do. Basic adjustments to the farming system, providing a bit more space, and the fresh air and natural feed that comes free with that land is all it takes to let the animals’ natural immune system do its job. According to recent studies in the US on the rate of salmonella, 38.8 percent of chickens were infected on non-organic farms, while only 5.6 percent were on organic farms. 27.5 percent of feed samples were infected on non-organic farms, while 5 percent were on organic farms . . . Almost 40% of the salmonella found on conventional chickens was resistant to a six-antibiotic treatment, whereas none of the salmonella found on organic chickens was resistant to the treatment. Salmonella may be the most famous, but it’s not the only disease that could be spread by conventional chicken. Staph bacteria, which causes pneumonia, sepsis and endocarditis is found on almost half of the meat and poultry found in grocery stores, and a little over half of that is immune to at least three antibiotics. Furthermore, chickens are fed the ground-up cattle parts considered too dangerous to feed humans or other cows because of the risk of Mad Cow Disease. Then cows are made to eat chicken carcasses and feces; a loophole through which the always fatal disease could be allowed to spread. This is not a necessary evil in order to have cheap protein. When the Swedish government banned the abuse of antibiotics as a preventative agent or growth stimulator in farming 26 years ago, the cost of pork only rose by a couple of cents. For now, certified organic is the only way to go if you want to keep drug resistant diseases away from your home; it does cost more, but it’s safer, and hopefully the extra cost is only temporary. If we can all band together and invest in organic products, perhaps we can convince these larger corporations that we care about our health, and that if they want our money they should invest in finding a new way to lower costs; one that doesn’t endanger human lives. Arsenic’s reputation as a poison should speak for itself. It can cause skin problems, damage lungs, reduce blood cell count, cause infertility, miscarriages, heart problems, brain damage and four kinds of cancer. It does, however, make a chicken grow just a tiny bit faster, and make its meat look a little bit pinker and fresher, which is why chemicals containing arsenic are frequently added to chicken feed in factory farms. These chemicals do break down, though, and traces of pure, toxic arsenic can be found in grocery store poultry. The whole factory farm process does more than cripple the nutritional value of its chicken; it destroys the flavor of it too. Many people will testify; organic chicken just tastes better, and if that isn’t enough, even the corporations that sell it seem to know their food isn’t up to par. Many companies ‘enhance’ their uncooked chicken with salt water. To make sure the whole chicken tastes like the ever satisfying sodium, the brine is injected directly into the meat, which incidentally means you end up paying extra for the 15% water and sodium weighing down the package, and can’t get rid of the 400 milligrams of extra sodium. Organic foods don’t contain any of these. Becoming certified organic is a dedication to a certain level of standards, to quality and responsibility. To be certified organic, a chicken can never be given antibiotics or hormones, or fed manure, GMO’s, or plants grown with synthetic fertilizers or pesticides. That’s why at Topline Foods, we’re proud to offer the best organic chicken available, to provide our customers with a meal designed with their best interests at heart.